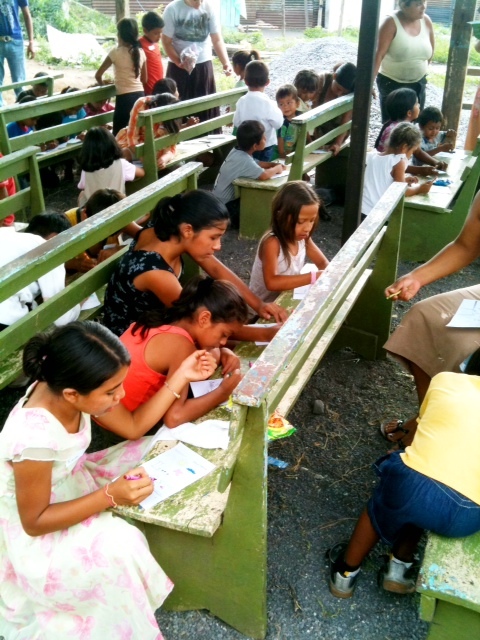 Bible School was what we expected and then some! “Organized chaos” to the extreme. The Lord sent some clouds and a breeze, the 95 degree weather didn’t seem so bad when we were in the shade. 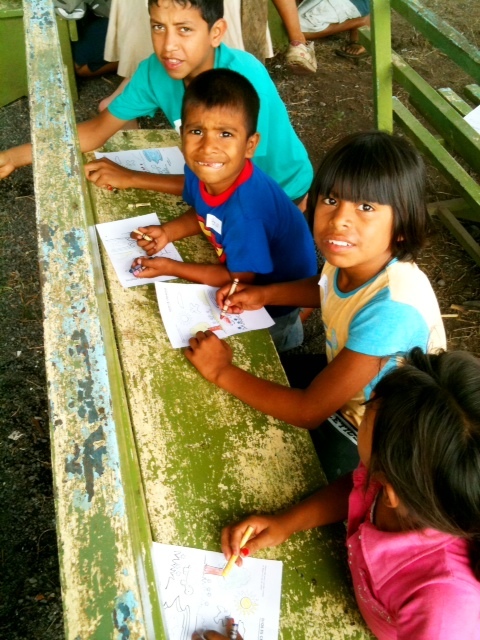 Children, like these, always steal my heart… I’m amazed at how clean they can be considering their circumstances. Bible School put the final touch of exhaustion on us. 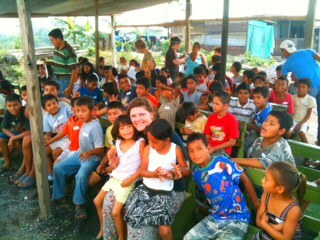 We made our way back to the house that we were staying at with ten more families waiting for their portion of food. 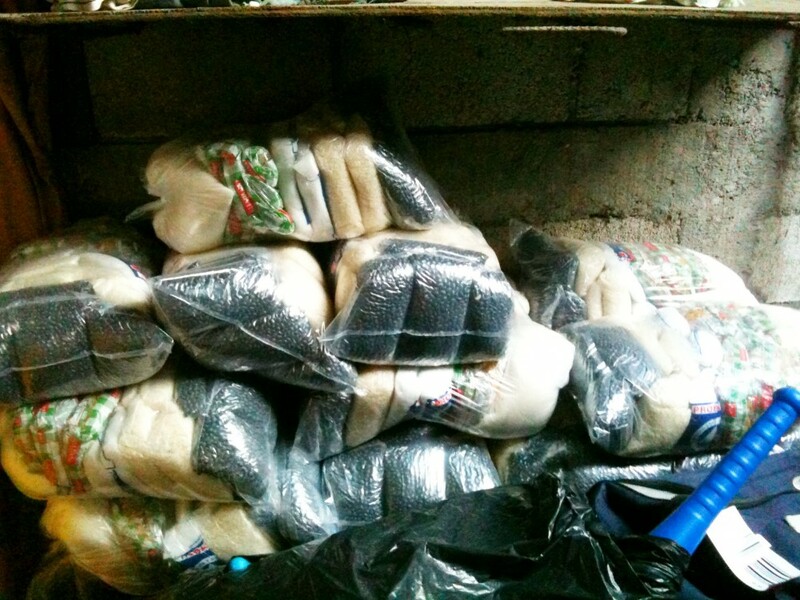 There has been some discussion about how we seem to have more bags of food than we should. It won’t be the first time that God has multiplied our resources but each time it is exciting! After some of Maresa’s delicious spaghetti we each had our cold water bucket showers and hit the sack. I woke at 10pm in a pool of sweat—reached for thermometer to see it read 95 degrees. Lucas, sleeping next to me, due to lack of room, had stacked his suitcases blocking any air to flow. With suitcases on one side and a wall on the other I was in my own personal thermos. So we moved the bags and by midnight it cooled off to around 85 degrees… thus, “sleeping weather”. Flexibility is a must on the mission field. We came expecting to put the roof on the church. Edson had been calling daily to check on the progress last week. He was assured that the building would be ready by today, but it wasn’t. 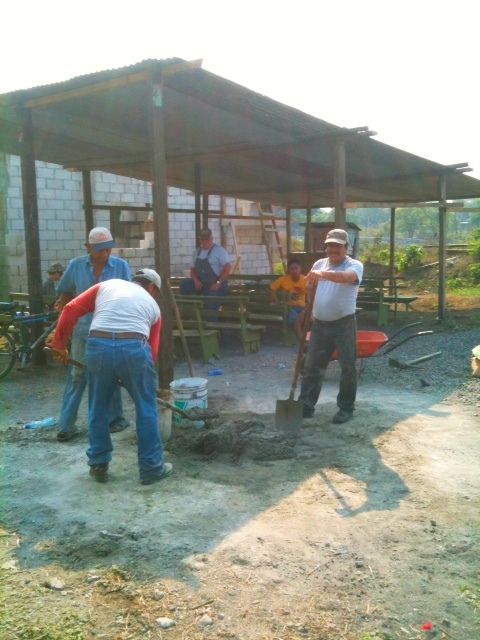 Today, a skilled mason came to help us finish the block work. 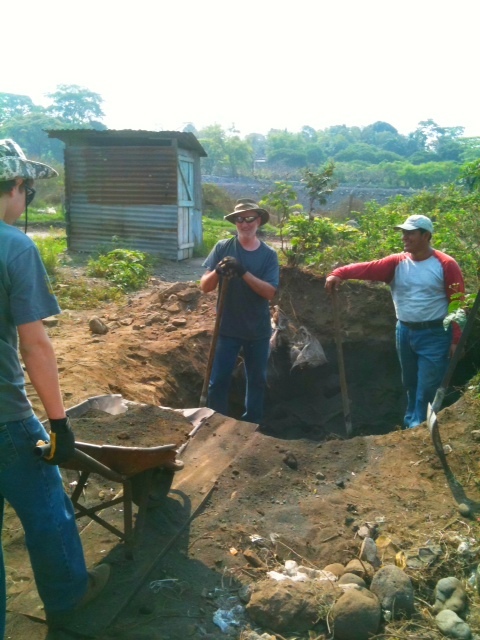 The team, being flexible, started filling the wheel barrows with dirt and leveling the floor area. At 11am, we took a break to distribute some food, then we set the makeshift pavilion up in order to hold more children. Today we are expecting 200 in Bible School and with the temperatures at 110 in the Summer with this high humidity, shade is important! Not so fast—still feeling as if things aren’t quite right yet. I went to the pharmacy for another dose of the killer med. 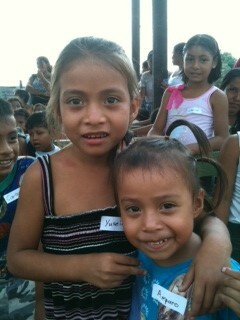 I figured that I, being twice the side of most Guatemalans, couldn’t be hurt by taking a few more. It’s another hot but blessed day here in paradise! Thanks for your prayers and support. Last time we were here I failed to introduce you to the community. 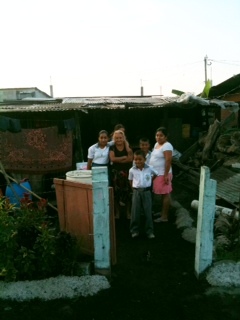 Many families, like this one shown here (above), are trying to rebuild their lives. 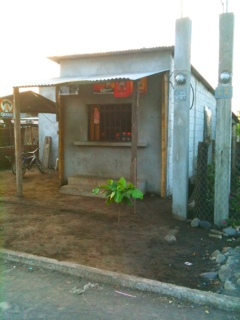 The local grocery is up and running! 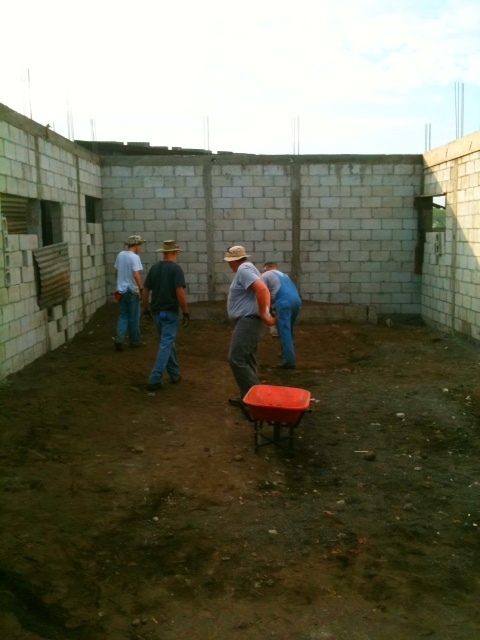 The new church building is almost ready for a roof. 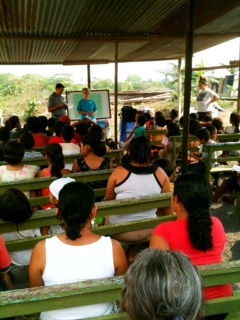 60 children came to Bible school. They are always a blessing to watch. The team constructed this temporary shelter out of old tin and wood. This provided some protection from the sun but it was still 98 degrees in the shade.